Interested in giving boxing a try but don’t know where to start? MINT Box may be the perfect fit for you! Our boxing-inspired group fitness program incorporates the basics of boxing using heavy bag work and target training supplemented with strength and cardio for a full body workout. Though every class is different the layout is similar to our other popular stationed based workouts like Power Playground and Flex. 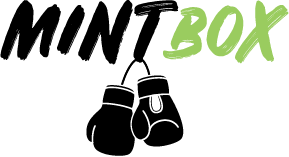 What makes MINT Box different from other boxing programs? It is a true fitness class designed to make you sweat while challenging you to use different muscles through heavy bag work. Our studio is equipped with Aqua Bags. Why does that matter? These bags are designed to improve the overall boxing experience absorbing your strikes so you can now achieve harder hits, for longer, without putting so much strain on your wrists and other joints. MINT Box is for all athletic abilities and ages 18+. No prior fitness or boxing experience is needed, just water, a towel, and a positive attitude! Plus, step up your workout another level in our signature Boxing+Power Playground Fuze classes! Avg. Caloric Burn 400-800 Calories.